Embattled Theresa May was handed a Brexit lifeline today amid claims that the EU is ready to make concessions over the Irish border. In a potential breakthrough, Brussels is said to be ready to accept that technology can be used to avoid friction between Northern Ireland and the Republic. The move could pave the way for a deal to be done by the end of the year - as long as Mrs May can hold warring Tories together long enough to get it through Parliament. But the scale of the task she still faces was underlined today when Boris Johnson launched another furious attack on her Brexit plan. He warned that it would make the decision to leave the EU a 'write off' and put Britain under 'foreign rule' for the first time since 1066. The intervention drew a stinging response from Downing Street, with the PM's spokesman pointing out that Mr Johnson was in government and hailed her achievement when the Irish border 'backstop' arrangement was struck with the EU in December. As she heads into a potential turbulent conference season, Mrs May used an interview with BBC Panorama to address raging speculation about her own future and where she is taking Britain. Dismissed 'irritating' Tory leadership jockeying and insisted she is focused on the country's fate rather than her own. Warned Brexiteer and Remainer MPs that her Chequers blueprint was the only alternative to 'no deal' and crashing out of the bloc. Suggested that EU citizens will not be given preferential treatment above nationals from the rest of the world after Brexit. 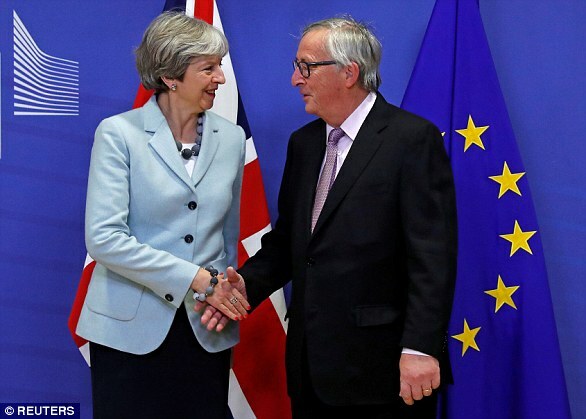 Promised to be 'bloody difficult' with EU negotiators as she tries to push through an agreement. Laying down the gauntlet to both Brexiteer and Remainer MPs who have been criticising her approach, Mrs May said if they voted down her deal they would not get a better one. 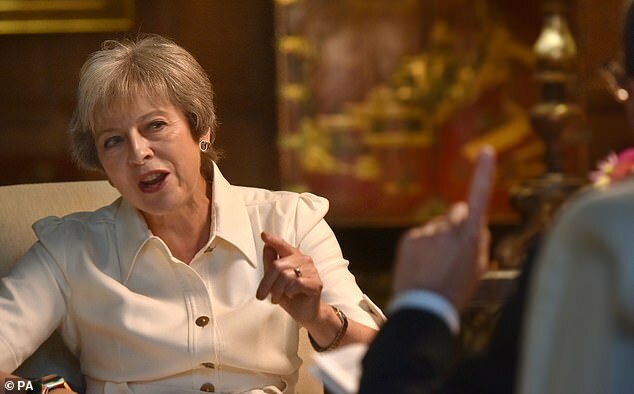 'When we come to it, I think parliament will vote for a deal because people will see the importance of a deal that maintains a good trading relationship with the EU... but gives us the freedom to take the benefits and opportunities of Brexit,' she said. What is in Theresa May's Brexit blueprint? 'Mobility' rules which will end automatic freedom of movement, but still allow UK and EU citizens to travel without visas for tourism and temporary work. It will also enable businesses to move staff between countries. A 'facilitated customs arrangement', removing the need for customs checks at UK-EU ports. It would allow differing UK and EU tariffs on goods from elsewhere in the world to be paid at the border, removing the need for rebates in the vast majority of cases. This is designed to avoid the need for a hard Irish border. But in theory it still allows Britain to sign trade deals. Keeping services - such as banking or legal support - outside of the common rule book, meaning the UK is completely free to set its own regulations. It accepts it will mean less trade in services between the UK and EU. Continued co-operation on energy and transport, a 'common rulebook' on state aid and commitments to maintain high standards of environmental and workplace protections. A security deal allowing continued UK participation in Europol and Eurojust, 'co-ordination' of UK and EU policies on foreign affairs, defence and development. Continued use of the EHIC health insurance card. Mrs May said chilling economic estimates about the consequences of no-deal Brexit were 'not a prediction' and the government would ease any impact. 'What is important is how the Government responds,' she said. 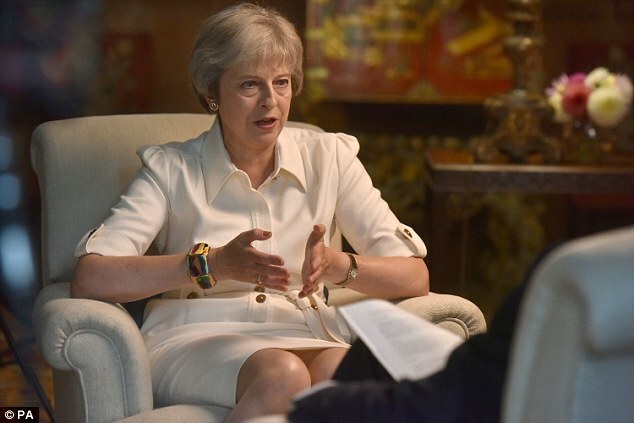 In the interview, to be broadcast tonight, Mrs May was asked by former BBC political editor Nick Robinson whether she is still the 'bloody difficult woman' referred to by former Tory Chancellor Ken Clarke. She replied that the 'bloody difficult woman' is 'still there', but 'there's a difference between those who think you can only be bloody difficult in public, and those who think actually you bide your time, and you're bloody difficult when the time is right – and when it really matters'. Home Secretary Sajid Javid used a Cabinet meeting last week to argue for 'shock and awe' tax cuts for business and a bonfire for regulation – in what was seen as his pitch for the top job. Other potential contenders are expected to use the party's conference this month to set out their stalls. But International Trade Secretary Liam Fox yesterday said he would back Mrs May if she wanted to fight the next election as party leader. He told Sky News's Sophy Ridge On Sunday: 'I think the Prime Minister is doing a great job in difficult circumstances domestically because of the lack of a majority in the Commons and in the difficult task of this negotiation with the EU. 'Supporting the Prime Minister now is in our national interest. Mrs May's position has been boosted by signs the EU is preparing to accept use of technology to avoid the need for new border infrastructure. 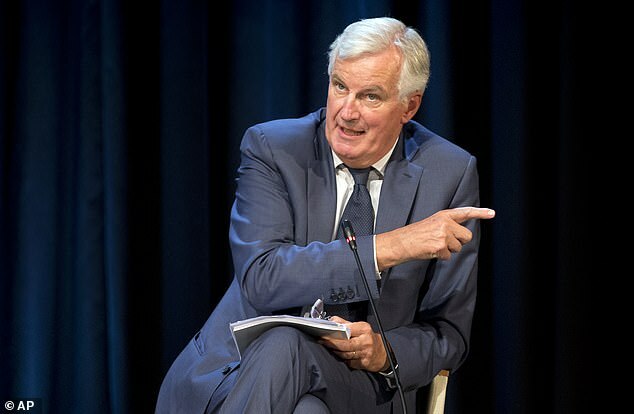 EU chief negotiator Michel Barnier is drafting a new 'protocol' text that includes the use of technology to minimise checks on the Irish border and between Northern Ireland and the UK, according to The Times. Diplomatic notes seen by the paper state: 'The biggest unsolved problem is Northern Ireland. How would the new EU plan for the Irish border work after Brexit? Under the new plan from Brussels, goods could be tracked using barcodes on shipping containers under 'trusted-trader' schemes - effectively removing the need for new border infrastructure. The proposals are expected to be circulated in early October after Conservative Party conference. Up to now the EU has insisted that Northern Ireland must stay within its jurisdiction for many customs and single market rules in order to avoid a hard border. But Mrs May has insisted no UK Prime Minister could ever accept a hard border in the Irish Sea that could put the union at risk, and her DUP allies in government are vehemently opposed. Instead, she has suggested a 'facilitated' customs arrangement that would see the whole UK accept EU rules for goods and collect some taxes on behalf of the bloc. The new EU draft could unlock the negotiations as it makes clear that most checks would not take place at any particular border. Sabine Weyand, Mr Barnier's deputy, told ambassadors: 'For the main part, these controls would not have to happen at a border. Brussels is drafting the plan to prevent Scottish nationalists from demanding the same arrangements - a major concern of the UK. However, the solution is still specific to Northern Ireland, rather than covering the whole UK as the government wants. But Mrs May has insisted no UK Prime Minister could ever accept a border in the Irish Sea that could put the union at risk, and her DUP allies in government are vehemently opposed. Sabine Weyand, Mr Barnier's deputy, told the ambassadors: 'For the main part, these controls would not have to happen at a border. 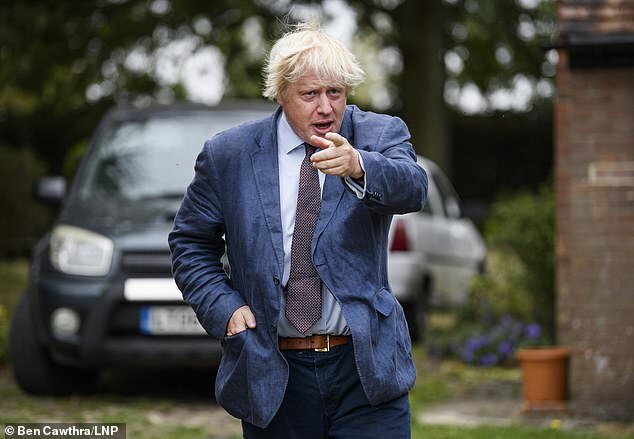 Despite the evidence of a thaw in talks, Mr Johnson warned that Britain is heading full throttle for a 'write-off' Brexit if it continues with Mrs May's 'disastrous' plan. The backstop deadlock is being used to force the UK into becoming a vassal state and the talks are on course to end in a 'spectacular political car crash', according to the former foreign secretary. Mr Johnson said the European Union's fallback position for the Irish border would mean Northern Ireland was 'annexed' by Brussels. Alternative plans set out by Mrs May would 'effectively' keep Britain in the bloc, he added. Environment Secretary Michael Gove described the PM's divisive Chequers plan as the 'right one for now' and suggested it could be altered by a future leader. But Mr Johnson said the exit proposals were taking the country in the wrong direction. 'If we are to get out of this mess, and get the great British motor back on track, then we need to understand the Irish backstop, and how it is being used to coerce the UK into becoming a vassal state of Brussels,' he added. The EU's backstop would leave a border down the Irish sea while the UK's proposal left it 'volunteering' to 'remain effectively in the customs union and large parts of the single market until Brussels says otherwise', Mr Johnson said. 'Both versions of the backstop are disastrous,' he wrote. 'One threatens the union; the other version - and its close cousin, Chequers - keep us effectively in the EU, as humiliated rules takers. 'We need to challenge the assumptions of both these Irish backstops, or we are heading full throttle for the ditch with a total write-off of Brexit. Mr Johnson said that if Chequers was adopted 'it would mean that for the first time since 1066 our leaders were deliberately acquiescing in foreign rule'. But the PM's spokesman gave the criticism short shrift - suggesting Mr Johnson was engaged in political manoeuvring. 'I think it is worth pointing out that Boris Johnson was a member of the Cabinet which agreed to the December joint report, including the backstop,' the spokesman said. Theresa May today appeared to dismiss the prospect of giving preferential access for EU citizens to the UK. The PM is preparing to unveil a new system for after Brexit - potentially in her Tory conference speech. However, there has been speculation over whether free movement-style arrangements will stay in place in order to ease negotiations with Brussels. Mrs May and Home Secretary Sajid Javid are thought to be arguing for a global system, but Chancellor Philip Hammond is expected to resist. 'At the time he congratulated the prime minister for her determination in securing the deal. Housing minister Kit Malthouse, who served as a deputy mayor of London under Mr Johnson, warned that Eurosceptics had to 'take the win' rather than keep protesting about Chequers. 'We have to be careful, those of us who voted Leave, that we don't become like a football team that is arguing about whether to win 2-0 or 4-0,' he told BBC Radio 4's Westminster Hour. But senior Tory Sir Bernard Jenkin backed Mr Johnson's view of the Brexit plans, saying he would prefer no-deal. He also accused firms like Jaguar Land Rover of 'making up' claims about huge jobs losses and economic chaos. 'No deal would be preferable than the Chequers proposals because we'd instantly be free, we'd save substantially on the payment that the EU wants us to make for the implementation period,' he told BBC Radio 4's Today programme. Former deputy prime minister Sir Nick Clegg accused Mrs May of presenting Britain with a 'con trick' choice on Brexit. Sir Nick, who is back in the political spotlight on Monday with an address to a meeting at the Lib Dem conference in Brighton, insisted the Prime Minister was offering either a 'fudge or the abyss' on EU exit by claiming the only alternative to her Chequers proposals is a no deal withdrawal. He told BBC Radio 4's Today programme: 'I think it is a deep disservice to our democratic traditions to have a Prime Minister now saying: 'You've got no choices left, it's my fudge or the abyss' - that is not true. Mrs May used her Panorama interview to slap down Mr Johnson for the extraordinary language he has used to criticise her Chequers plan. In last week's Mail on Sunday, he likened her the proposals to a 'suicide vest around the British constitution'. Mrs May implied that Mr Johnson's comments, which triggered a political storm, showed he was unfit for the highest office. 'I have to say that that choice of language is completely inappropriate,' she said. The UK side initially set out two options for how the border could look. A 'Maximum Facilitation' scheme would have seen a highly streamlined customs arrangement, using a combination of technology and goodwill to minimise the checks on trade. The second option was described as a customs partnership, which would see the UK collect tariffs on behalf of the EU - along with its own tariffs for goods heading into the wider British market. At the Chequers Cabinet summit earlier this month, Mrs May pushed through a compromise plan with elements of both. It would see the UK follow a 'common rule book' with the EU on goods and collect some tariffs on behalf of Brussels to avoid border friction. UK courts would also take account of decisions by EU judges. Brexiteers have been incensed by the proposal, which they say makes too many concessions and will prevent Britain doing trade deals elsewhere. Boris Johnson and David Davis quit in protest, threatening to send Mrs May tumbling out of Downing Street. But when the EU translated this option into a legal text they hardened it further to make clear Northern Ireland would be fully within the EU customs union and most single market rules. The new EU draft could unlock the negotiations as it accepts a key element of the UK's about the use of technology, and makes clear that most checks would not take place at any particular border. 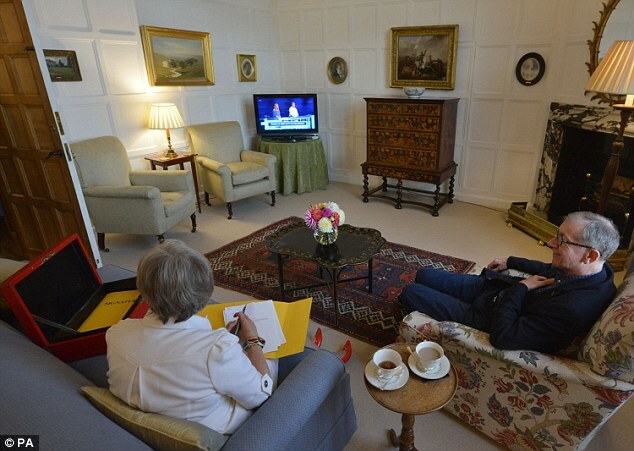 As Prime Minister she rarely gets time to put her feet up and watch television. 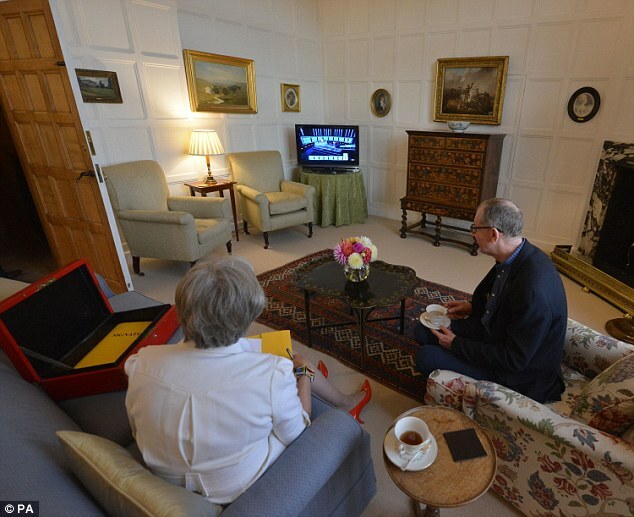 But a new documentary will reveal how Theresa May and her husband Philip like to watch teatime game show The Chase when they can. 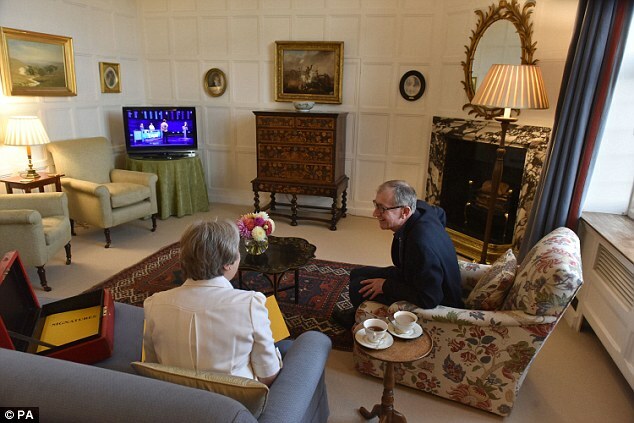 The BBC Panorama programme, to be screened tonight, shows the couple catching up over a cup of tea in front of the television. 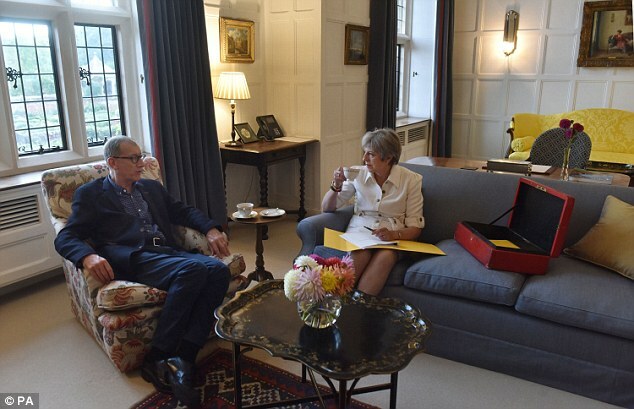 Despite working on papers from her red box, Mrs May, 61, chips in with answers to some of the questions on the ITV quiz show. The footage was filmed at the Prime Minister's country residence Chequers on Friday afternoon. Mr May, 60, who had just returned from a business trip to America, is understood to be a fan of quiz shows and also enjoys BBC Two's Eggheads. The couple, who celebrated their 38th wedding anniversary earlier this month, met whilst studying at Oxford University. 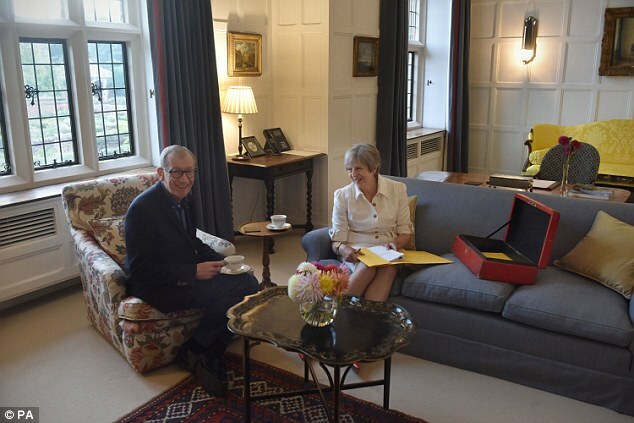 Mrs May has previously credited her husband with helping her through the tragedy of both her parents passing away when she was aged 25, the year after they had married. Mr May works as a relationship manager at an investment management company in the City.